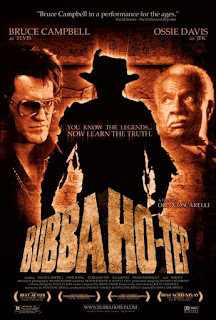 Bubba Ho-Tep is one of my all time favorite movies. I mean, how can you beat a film where Elvis, alive and dying of old age, teams up with a black man who thinks he’s JFK to battle an ancient Egyptian Mummy who’s terrorizing a Texas rest home? The movie seamlessly combines pop-culture, comedy, and horror into one film and features a stellar performance by Bruce Campbell as Elvis. I just found out they’re making a prequel! Bubba Nosferatu. As the title suggests, they will be adding in one of my other all-time favorite figures from folklore: Vampires! Tragically, Bruce Campbell will not be reprising his role as the King. Instead, Ron Pearlman will be donning the blue suede shoes. Now, I’m actually a big fan of Ron Pearlman and I think he has the right swagger to pull off playing Elvis. He’s got two things working against him, however. For one, he’s enormous. And for another, well… he’s not Bruce Campbell. Those are some big shoes to fill; fortunately Ron Pearlman has large feet.